Latency Mitigation: TCP and other protocol acceleration techniques minimize the effects of latency on application performance and significantly improve application response time across the WAN. Data Reduction: WAN compression and deduplication is applied to all traffic, eliminating repetitive transmission of duplicate data. Silver Peak software inspects WAN traffic at the byte level and stores content in local data stores. Advanced finger-printing techniques recognize repetitive patterns for local delivery. Data Reduction can be applied to all IP-based protocols, including TCP and UDP. However, sometimes additional performance is needed for specific applications or locations. As distance between locations increases over the WAN, application performance degrades. This has less to do with the available bandwidth, and is more about the time it takes to send and receive data packets over distance, and the number of times data must be re-sent. Unity Boost leverages Silver Peak’s industry leading application acceleration features to deliver high performing SD-WANs. Customers replicating to a disaster recovery (DR) site located thousands-of-miles away might want to add Unity Boost to ensure recovery point objectives (RPOs) are not compromised. Enterprises with remote sites that are located in a rural areas, or with sites that are exceptionally farther away from the company’s data center, might want to add Unity Boost to overcome the effects of high latency. With Unity Boost, customers gain the flexibility to enable enhanced WAN optimization capabilities where and when it is needed. Unity Boost is licensed per-megabit-per-second, per-month, so customers do not have to pay for WAN optimization across the entire network. This data sheet highlights the capabilities of Unity Boost, an optional performance pack for Unity EdgeConnect deployments. This data sheet highlights the features and capabilities of Silver Peak Unity EdgeConnect. 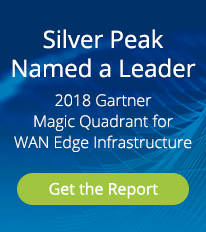 Unity Orchestrator offers customers the unique ability to centrally assign business intent policies to secure and control all Silver Peak Unity EdgeConnect softwaredefined Wide Area Network (SD-WAN) traffic. An intuitive user interface provides unprecedented levels of visibility into both data center and cloud-based applications.